Our local hamlet is putting on a Christmas Musicale later this month. In addition to singing a shaky soprano in the choir, I’m also taking part in a girls trio doing Ave Maria. We’re using Schubert’s setting, since it’s probably the most familiar these days — thanks to Frank Sinatra, et al. What I didn’t know was that Schubert, who composed the iconic melody and cascading arpeggio accompaniment in 1825, didn’t write it for the Latin prayer. 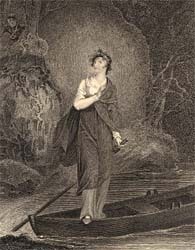 It was part of his seven-song cycle for a German translation of Sir Walter Scott’s Lady of the Lake. I’ll pause a moment while that sinks in. Or maybe you already knew, and I am the only one floored by this revelation, courtesy Wikipedia. Perhaps it hits me particularly hard, since Lady of the Lake is one of my absolute favorites. Listen to a maiden’s prayer! Help Me Choose a Costume! I’ve already revealed that I’m going to do the unthinkable — sing in public. I also have to play the cello briefly during the same program. So of course the question arises, what to wear, WHAT TO WEAR? The theme of the concert is early 20th-century American music and I initially planned to drag out my Edwardian duds (see the picture at the bottom of this post). But that would require a corset. And I’ve gained five pounds in the last three months (doughnuts and steak). And I already have trouble breathing when I sing. So…the search begins. Luckily I’ve recently been reunited with a lifetime of costumes rescued from my (ever-patient) mother’s attic. Some fantastic pieces that I should never have used for “dress-up,” a few that should have died long ago, and many just plain goofy get-ups. This is the current front runner. It’s royal blue velveteen with a back zip and sash and elasticized sleeves. Very comfortable. I have no idea where it came from. It’s built like a costume — and come on, who would wear a floor-length velveteen dress if they weren’t on stage? On the other hand, it’s pretty conservative for theater and has standard care tags as though it were factory made. There’s absolutely no pressure on my abdomen in this dress, and it is more than flexible enough for celloing. The color definitely suits me too, and would lend itself to delicate jewels or pearls. 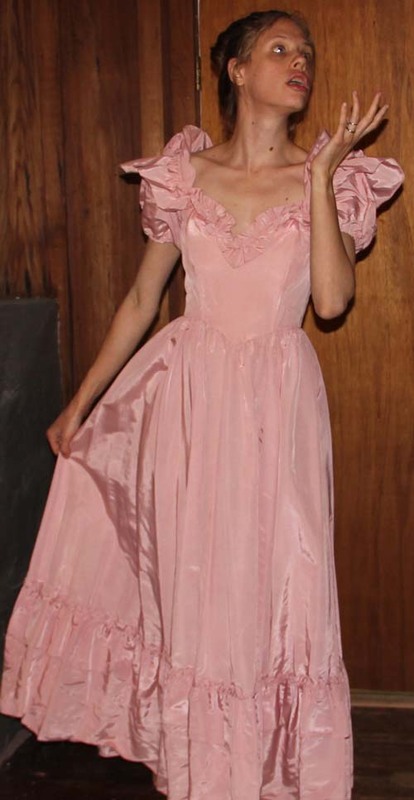 It’s a vintage Gunnie Sax formal in pink taffeta, probably from the mid 1980s. Yep, those are fabric roses on each shoulder. 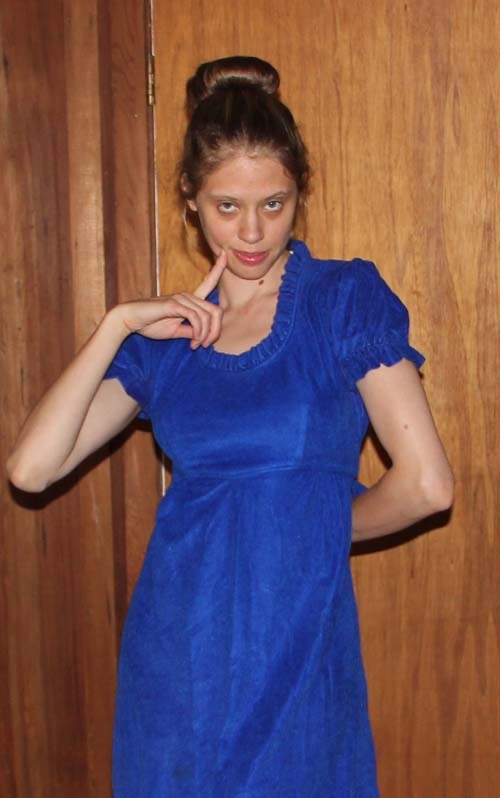 I adore this dress and wore it to my thirteenth birthday party (my indulgent parents dressed up like a French maid and butler and threw a “murder-mystery” sleep over with my hamster, Edward Bringhurst IV, as the hapless “victim”). It’s a perfect waltz gown, and also comfortable enough for singing and playing. I’d pair it with some vintage rhinestone jewelry and a large hair-do. The downsides include a skirt that screams for crinoline (which I haven’t got), shoulders that insist on slipping at awkward moments, a rather scanty neckline, and a color that washes me out. What do you think? Help me choose! 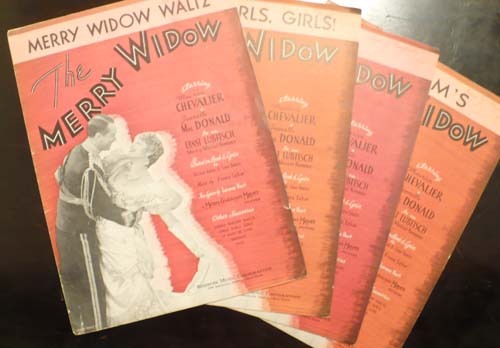 This lilting waltz is the grande finale of an operetta by Austro-Hungarian composer Franz Lehár called “The Merry Widow,” or “Die lustige Witwe.” Based on a mid-19th century play about a rich widow being wooed for her bank roll, the production made its Vienna debut in 1905. In 1934 it became a Hollywood musical under the direction of Ernst Lubitsch with new English lyrics by Tin Pan Alley’s own Lorenz Hart. Jeanette MacDonald and Maurice Chevalier starred. Believe it or not, I’d already decided to sing the song when I came across this sheet music in one of my moving boxes. It belonged to my grandmother, who dated it 1935 in the upper right corner; presumably the year she purchased it. She also had three other lead sheets from “The Merry Widow” — more than she owned for any other musical. What does that say about genetics? Of course I immediately discarded my old arrangement and opted to use this one, along with the new lyrics (I’d been using a 1930 arrangement and translation published in the Maxwell House Showboat music book).